2017-04-18 First worldwide family litigation filed litigation Critical https://patents.darts-ip.com/?family=47090649&utm_source=google_patent&utm_medium=platform_link&utm_campaign=public_patent_search&patent=US9170349(B2) "Global patent litigation dataset” by Darts-ip is licensed under a Creative Commons Attribution 4.0 International License. The present invention relates to ionic silicone hydrogel polymers displaying improved lysozyme uptake, low contact angle and reduced water soluble polymeric ammonium salt uptake. This application claims priority to U.S. Provisional Patent Application No. 61/482,379, filed on May 4, 2011 entitled MEDICAL DEVICES HAVING HOMOGENEOUS CHARGE DENSITY AND METHODS FOR MAKING SAME, the contents of which are incorporated by reference. The present invention relates to ionic silicone hydrogels, and ophthalmic devices formed therefrom, which display desirable tear and polycationic ophthalmic solution component uptake profiles. It is well known that contact lenses can be used to improve vision. Various contact lenses have been commercially produced for many years. Hydrogel contact lenses are very popular today. These lenses are formed from hydrophilic polymers and copolymers containing repeating units from hydroxyethylmethylacrylate (HEMA). Of these contact lenses formed from copolymers of HEMA and methacrylic acid, are among the most comfortable, and have the lowest rate of adverse events. Contact lenses formed from copolymers of HEMA and MAA, such ACUVUE contact lenses, display substantial amounts of lysozyme uptake (greater than 500 μg) and retain a majority of the uptaken proteins in their native state. However, hydrogel contact lenses generally have oxygen permeabilities that are less than about 30. Contact lenses made from silicone hydrogels have been disclosed. These silicone hydrogel lenses have oxygen permeabilities greater than about 60, and many provide reduced levels of hypoxia compared to conventional hydrogel contact lenses. Unfortunately, attempts to add anionic components to silicone hydrogels in the past have produced contact lenses which are not hydrolytically stable and display moduli which increase when exposed to water and heat. Also, while adding ionicity to silicone hydrogels has increased lysozyme uptake, it has also often increased uptake of positively charged components from contact lens multipurpose solutions. One such component is PQ1, a polyquaternium disinfecting compound. Also, many silicone hydrogels have higher than desired contact angles. The present invention relates to ionic silicone hydrogel polymers and contact lenses formed therefrom displaying desirable performance characteristics, including contact angles of about 70° or less, at least about 50 μg/lens cationic tear component lysozyme uptake, and less than about 10% uptake of at least one polycationic component from an ophthalmic solution with which the polymers or contact lenses are contacted. wherein said major polymerizable components comprise a single reactive functionality. In another embodiment, the silicone hydrogels of the present invention comprise at least one statistical copolymer comprising units derived from at least one anionic monomer and at least 10 weight % of at least one non-ionic hydrophilic monomer. The present invention relates to control of the spatial density and concentration of anionic charges in silicone hydrogel materials and articles made therefrom. It has been found that ionic silicone hydrogel polymers and articles made therefrom may be made having desirably increased tear component uptake (including lysozyme) and low or no uptake of polycationic components from cleaning and care solutions. The silicone hydrogels and articles made therefrom may be made from ionic statistical copolymers or may have associated therewith, at least one non-crosslinked (soluble), ionic statistical copolymer. In this embodiment the ionic statistical copolymer associates with the lens either through entanglement, association or a combination thereof. For example the contact lens may comprise NVP or PVP as a component in the lens body. In this embodiment, the anionic statistical copolymer forms a persistent association with the lactam moiety of the pyrrolidone. Alternatively the anionic statistical copolymer may comprise a hydrophobic block on at least one terminus. The hydrophobic block of the anionic statistical copolymer associates with the silicone in the silicone hydrogel contact lens. As used herein, a “biomedical device” is any article that is designed to be used while either in or on mammalian tissues or fluid. Examples of these devices include but are not limited to catheters, implants, stents, and ophthalmic devices such as intraocular lenses, inlay lenses and contact lenses. As used herein an “ophthalmic device” is any device which resides in or on the eye or any part of the eye, including the cornea, eyelids and ocular glands. These devices can provide optical correction, cosmetic enhancement, vision enhancement, therapeutic benefit (for example as bandages) or delivery of active components such as pharmaceutical and neutraceutical components, or a combination of any of the foregoing. Examples of ophthalmic devices include lenses and optical and ocular inserts, including, but not limited to punctal plugs and the like. As used herein, the term “lens” refers to ophthalmic devices that reside in or on the eye. The term lens includes but is not limited to soft contact lenses, hard contact lenses, intraocular lenses, overlay lenses. The medical devices, ophthalmic devices and lenses of the present invention are, in one embodiment, made from silicone elastomers or hydrogels, which include but are not limited to silicone hydrogels, and silicone-fluorohydrogels. These hydrogels contain hydrophobic and hydrophilic monomers that are covalently bound to one another in the cured lens. As used herein “uptake” means associated in, with or on the lens, deposited in or on the lens. “Percent (%) uptake” of polycationic components means the percent of the polycationic component which associates in, with or on the lens or deposits in or on the lens compared to the total amount of that polycationic component in the ophthalmic solution prior to contact with the silicone hydrogels of the present invention. As used herein “reactive mixture” refers to the mixture of components (both reactive and non-reactive) which are mixed together and subjected to polymerization conditions to form the ionic silicone hydrogels of one embodiment of the present invention. The reactive mixture comprises reactive components such as monomers, macromers, prepolymers, cross-linkers, initiators, diluents and additives such as wetting agents, release agents, dyes, light absorbing compounds such as UV absorbers and photochromic compounds, any of which may be reactive or non-reactive but are capable of being retained within the resulting medical device, as well as pharmaceutical and nutriceutical compounds. It will be appreciated that a wide range of additives may be added based upon the medical device which is made, and its intended use. Concentrations of components of the reactive mixture are given in weight % of all components in the reaction mixture, excluding diluent. When diluents are used their concentrations are given as weight % based upon the amount of all components in the reaction mixture and the diluent. 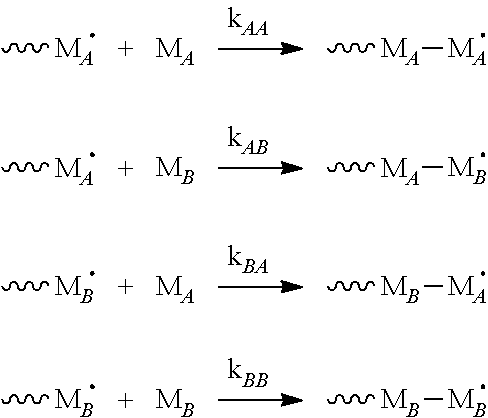 As used herein a statistical copolymer is a polymer having at least one segment formed from reactive components having substantially similar reaction rate constants, k for reaction with themselves and with each other. For example, statistical copolymers include crosslinked polymer matrices which are formed from reactive components having the same reactive functionality, polymers formed from reactive components having the same reactive functionality and block copolymers where at least one block is formed from reactive components having the same reactive functionality. Generally, substantially similar reaction rate constants are within about 10%. Reactive components which have the same reactive functionality have substantially similar reaction rate constants. As used herein, cationic tear components include cationic proteins including lactoferrin, lysozyme, serum albumin, and secretory immunoglobulin A. Lysozyme is a preferred cationic tear component. As used herein, ophthalmic solutions are solutions which are instilled in the eye or are used to condition or clean devices which are placed in the ocular environment. Examples of ophthalmic solutions include eye drops, rewetting drops, contact lens multipurpose solutions, packaging solutions for ophthalmic devices, including contact lenses. Contact lens multipurpose solutions frequently contain polycationic components. Polycationic components include positively charged organic compounds, such as cationic water soluble polymeric ammonium salts, such as biguanides, bisbiguanides and polyquaternium containing compounds, also called “polyquats” or PQ compounds. Polyhexamethylene biguanide (PHMB) is a common biguanide used in contact lens, multipurpose, cleaning and care solutions. Examples of water soluble polymeric ammonium salts include polycationic polymers having quartenary ammonium centers. Examples include PQ-1, PQ-42 (poly[oxyethylene(dimethyliminio)ethylene (dimethyliminio)ethylene dichloride]), and the like. Cationic water soluble polymeric tetraalkyl phosphonium salts may also be used in place of the ammonium salts. Non-polymeric cationic organic components having two or more cations such as chlorhexidine (N′,N″″-hexane-1,6-diylbis[N-(4-chlorophenyl)(imidodicarbonimidic diamide)], or CHG), and the like may also be included. Inorganic charged ions, such as sodium ions are not cationic components as defined herein. PQ1 is a cationic copolymer having quarternary ammonium ions in its polymer backbone. Specifically PQ1 is poly[(dimethyliminio)-2-butene-1,4-diyl chloride (1:1)], α-[4-[tris(2-hydroxyethyl)ammonio]-2-buten-1-yl]-ω-[tris(2-hydroxyethyl)ammonio]-, chloride (CAS 75345-27-6). Contact lens solutions, including multipurpose solutions and cleaning solutions, generally also contain citrates such as citrate dihydrate and citric acid monohydrate to help prevent PQ1 uptake by contact lenses. However, the addition of anionicity to silicone hydrogel lenses can result in undesirable PQ1 uptake by the lens, even in the presence of citrates. In another embodiment, the present invention further provides desirably low uptake of water soluble polymeric ammonium salts. RAFT refers to reversible addition fragmentation-chain transfer polymerization, a form of “pseudo-living” free radical polymerization. Hydrophilic components are components that are at least 10% soluble in water. So, if 10 weight parts of the monomer are combined with 90 weight parts of water, a clear, single phase solution is formed with mixing at room temperature. Anionic components are components comprising at least one anionic group and at least one reactive group. Anionic groups are groups which bear a negative charge at neutral pH. Examples of anionic groups include carboxylate groups, phosphates, sulphates, sulphonates, phosphonates, borates, mixtures thereof and the like. In one embodiment the anionic components comprise three to ten carbon atoms, and in another, three to eight carbon atoms. In an embodiment the anionic groups comprise carboxylate groups or sulphonate groups. Anionic components also include ionizable salts of any of the foregoing, for examples salts containing calcium, sodium, lithium, magnesium and mixtures thereof. Reactive functionality or groups include those that can undergo chain reaction polymerizations, such as free radical and/or cationic polymerization under polymerization conditions. It is also possible to synthesize silicone copolymers via step reaction polymerization such as polyesters from the reaction of diols and diacids and polyurethanes from the reaction of diols and di-isocyanates or via thiol-ene reactions. In general, polymerizable groups can be classified as activated or unactivated polymerizable groups. R′ is O or N which is further substituted a group selected from H, C1-3 alkyl groups which may be further substituted with hydroxyl groups, carboxyl groups or carboxyester groups; or R′ may be an alkenylene, which taken with R″ forms a phenyl ring. In one embodiment R′ is O or N substituted with H or unsubstituted C1-3 alkyl. 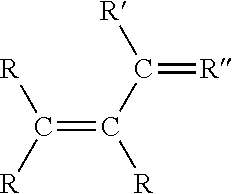 R″ is O or an alkenylene which when taken with R′ forms a phenyl ring. Examples of activated polymerizable groups include acrylate or methacrylate esters, itaconic acid esters, fumaric or maleic acid esters, acrylamides or methacrylamides, or styrenes. in which each R may be H, C1-C4 alkyl groups which may be unsubstituted or substituted with hydroxyl, carboxy, carboxyester, Cl, Br, O, or N(R2)COR3, R2 is H or COR3, unsubstituted C1-3 alkyl, R3H or unsubstituted C1-3, and Rx and Ry may together be propylene, O may be substituted with C1-3 alkyl or CORx provided that the atom bonded to the carbon-carbon bond is not itself doubly or triply bonded. Examples of unactivated polymerizable groups include vinyl lactams, vinyl amides, vinyl carbonates, vinyl carbamates, allyl ethers, allyl alcohols and the like. Non-limiting examples of free radical reactive groups include (meth)acrylates, styryls, vinyls, vinyl ethers, C1-6alkyl(meth)acrylates, (meth)acrylamides, C1-6alkyl(meth)acrylamides, N-vinyllactams, N-vinylamides, C2-12alkenyls, C2-12alkenylphenyls, C2-12alkenylnaphthyls, C2-6alkenylphenylC1-6alkyls, O-vinylcarbamates and O-vinylcarbonates. Non-limiting examples of cationic reactive groups (groups that can polymerize under cationic polymerization conditions) include vinyl ethers or epoxide groups and mixtures thereof. In one embodiment the reactive groups comprises (meth)acrylate, acryloxy, (meth)acrylamide, and mixtures thereof. Any chemical name preceded by (meth), for example (meth)acrylate, includes both the unsubstituted and methyl substituted compound. Generally, the relative values of rA and rB, the mole fractions of both monomers, and the extent of conversion of the copolymerization are the major factors which dictate the microstructure of the resultant copolymer. In general there are limiting cases for rA and rB that apply specifically to the invention disclosed herein. In cases where rA and rB are equal and approach unity (e.g. rA=rB≈1) the copolymerization is considered to be “random” or “statistical,” i.e. there is an equal probability that monomer A will add to itself and to monomer B, and monomer B will add to itself and monomer A with equal probability also. In one embodiment “similar” reactivity ratios are those for which the reactivity ratios of the fastest and slowest reactive components in the reactive mixture are within 25% of each other, and in another embodiment within about 10% of each other, and in another embodiment within about 5% of each other. In some embodiments minor reactive additives, such as reactive dyes or UV absorbers can have reactivity ratios which are greater than the herein disclosed ranges. The reactivity ratios may be determined by measuring the relative depletion of monomer A and B from the polymerization solution and the relative incorporation of A and B into the resultant copolymer. This measurement is taken at low total monomer conversion, i.e. around 10-20%, and is repeated across a range of initial monomer compositions between 1-99% A or 99-1% B. In another embodiment, the random or statistical copolymers are formed from charged monomers and other monomers comprising the same reactive double-bonds (anionic charge-bearing acrylamido-monomers being paired with other acrylamido-comonomers or anionic charge-bearing methacrylic-monomers being paired with other methacrylate-comonomers). As shown by the Examples herein, the consumption of charge-bearing monomers with other monomers that contain the same reactive functionality produce lenses which display the desired selective uptake of cationic tear components, such as lysozyme over polycationic components, such as PQ1. Reactive mixtures comprising reactive components having the same reactive functionality and similar reactivity ratios (that approach unity), which produce the homogeneous distribution of charge across the surface and throughout the bulk of the lens. Where rA=rB≈0, the probabilities of monomers A and B adding to themselves is very low. This results in the formation of alternating copolymers of A and B, and lens materials having the desired distribution of charge throughout the lens and the desired selective uptake of cationic tear components over polycationic components. Where rA>1>rB, statistical copolymers of the present invention are not formed. In this case early in the polymerization, monomer A is consumed at a higher rate than monomer B. At this early point in the copolymerization, copolymers that are formed are very rich in monomer A. As the polymerization progresses and monomer A is depleted over monomer B, thus changing the relative mole fractions in favor of monomer B, the copolymer microstructure shifts from being rich in monomer A to rich in monomer B. This occurs until all or most of monomer A is consumed, at which point the polymer that is formed is completely or mostly composed of monomer B. This is also known to those skilled in the art as “compositional drift.” In a comparative example of this invention, an anionic acrylamido-monomer is copolymerized in a mixture of methacrylates and other acrylamides to make a contact lens or medical device. In this case, it is believed that the methacrylates are consumed at a much higher rate, compared to the acrylamido-monomers early in the polymerization. This continues until all or most of the methacrylates are consumed, after which point the acrylamido-monomers are consumed and the polymerization reaches 100% conversion. Because the anionic charge-bearing acrylamido-monomer has a much higher probability of being consumed later in the reaction, the charge in and on the bulk and surface of the substrate is not homogeneously distributed throughout the polymer bulk. This leads to a significant amount of PQ1 uptake as well as lysozyme, which is undesirable. When rA=rB>1, blocky-type copolymers are formed. In this case monomer A has a high probability of adding to itself over monomer B and monomer B has a high probability of adding to itself over monomer A. In extreme cases, where A would rarely add to B and vice versa, i.e. where rA=r8>>1, formation of a mixture of homopolymers is anticipated. These cases are believed to produce a heterogeneous distribution of charge in and on the resulting substrate. It has been found that by selecting the components of the reactive mixture such that reactivity rates are substantially matched, statistical copolymers can be made wherein the units from the anionic monomers are randomly distributed throughout either the polymer or at least one segment of the polymer, depending upon the embodiment of the present invention. The random distribution of negative charge throughout the polymer is believed to provide a delocalization of charge, which provides increased uptake by the polymer of beneficial proteins such as lysozyme, but low uptake of positively charged components in contact lens solutions, including polyquarternium salts, such as, but not limited to PQ1. Thus, in one embodiment the non-ionic hydrophilic monomer and the anionic monomer are either both activated or both unactivated. In another embodiment the reactive functionality for both the non-ionic hydrophilic monomer and the anionic monomer are the same, for example both the non-ionic hydrophilic monomer and the anionic monomer are both are methacrylates. In another embodiment both the non-ionic hydrophilic monomer and the anionic monomer are methacrylamides. Non-limiting examples of such combinations are included in the Examples below. Examples of suitable anionic components include reactive carboxylic acids, including alkylacrylic acids, such as (meth)acrylic acid, acrylic acid, itaconic acid, crotonic acid, cinnamic acid, vinylbenzoic acid, fumaric acid, maleic acid, monoesters of furmaric acid, maelic acid and itaconic acid; 3-acrylamidopropionic acid, 4-acrylamidobutanoic acid, 5-acrylamidopentanoic acid, N-vinyloxycarbonyl-α-alanine, N-vinyloxycarbonyl-β-alanine (VINAL), 2-vinyl-4,4-dimethyl-2-oxazolin-5-one (VDMO), reactive sulphonate salts, including sodium-2-(acrylamido)-2-methylpropane sulphonate, 3-sulphopropyl(meth)acrylate potassium salt, 3-sulphopropyl(meth)acrylate sodium salt, bis 3-sulphopropyl itaconate di sodium, b is 3-sulphopropyl itaconate di potassium, vinyl sulphonate sodium salt, vinyl sulphonate salt, styrene sulphonate, 2-sulphoethyl methacrylate and mixtures thereof and the like. In one embodiment the anionic component is selected from reactive carboxylic acids, in another from methacrylic acid and N-vinyloxycarbonyl alanine. In another embodiment, where the reactive monomers comprise acrylamido reactive groups the anionic monomer comprises an acrylamide acid, such as 3-acrylamidopropionic acid, 4-acrylamidobutanoic acid, 5-acrylamidopentanoic acid, 2-acrylamido-2-methylpropane sulphonic acid, salts of said acrylamido acids and combinations thereof. Suitable salts include ophthalmically compatible salts including sodium, potassium and calcium salts. It has been surprisingly found that the acrylamido sulphonic acid or acrylamido sulphonic acid salts are compatible with the all acrylamide formulations of the present invention. The acrylamido sulphonic acid or acrylamido sulphonic acid salts are generally too polar to be soluble in silicone hydrogel reactive mixtures, even at the low molar concentrations disclosed herein. However, when the single reactive functionality is methacrylamide acrylamido sulphonic acid or acrylamido sulphonic acid salt may be directly incorporated into the reactive mixture in amounts up to about 5 mole %, in some embodiments up to about 3 mol %, and in other embodiments between about 0.1 to about 2 mol %. In another embodiment the reactive components comprise methacrylate groups and the ionic component comprises methacrylic acid. It is understood that these monomers may be copolymerized in a non-ionic (ester) form, and then deprotonated or hydrolyzed to form ionic groups in the final product. Those of skill in the art will understand that the foregoing anionic monomers are selected based upon the functionality of the other reactive components. For example, when the major polymerizable components comprise acrylamide reactive functionality the anionic monomer may be 3-acrylamidopropionic acid, 4-acrylamidobutanoic acid, 5-acrylamidopentanoic acid, sodium-2-(acrylamido)-2-methylpropane sulphonate, 2-acrylamido-2-methylpropane sulfonic acid and combinations thereof. When the major polymerizable components comprise (meth)acrylate functionality the anionic monomer may be (meth)acrylic acid, itaconic acid, crotonic acid, cinnamic acid, fumaric acid, maleic acid, monoesters of furmaric acid, 3-sulphopropyl(meth)acrylate potassium salt, 3-sulphopropyl(meth)acrylate sodium salt, b is 3-sulphopropyl itaconate di sodium, bis 3-sulphopropyl itaconate di potassium, sulphoethyl methacrylate, and mixtures thereof. In another embodiment the major polymerizable components comprise (meth)acrylate functionality, and the anionic monomer may be (meth)acrylic acid, 3-sulphopropyl(meth)acrylate potassium salt, 3-sulphopropyl(meth)acrylate sodium salt, sulphoethyl methacrylate, and mixtures thereof. When the major polymerizable components comprise vinyl functionality the anionic monomer may be N-vinyloxycarbonyl-α-alanine, N-vinyloxycarbonyl-β-alanine, 2-vinyl-4,4-dimethyl-2-oxazolin-5-one, vinyl sulphonate sodium salt, vinyl sulphonate salt, and mixtures thereof. Suitable non-ionic hydrophilic monomers include N,N-dimethyl acrylamide (DMA), 2-hydroxyethyl methacrylate (HEMA), glycerol methacrylate, 2-hydroxyethyl methacrylamide, polyethyleneglycol monomethacrylate, N-vinyl amides, N-vinyl lactams (e.g. NVP), N-vinyl-N-methyl acetamide, N-vinyl-N-ethyl acetamide, N-vinyl-N-ethyl formamide, N-vinyl formamide. Vinyl carbonate or vinyl carbamate monomers, such as those disclosed in U.S. Pat. No. 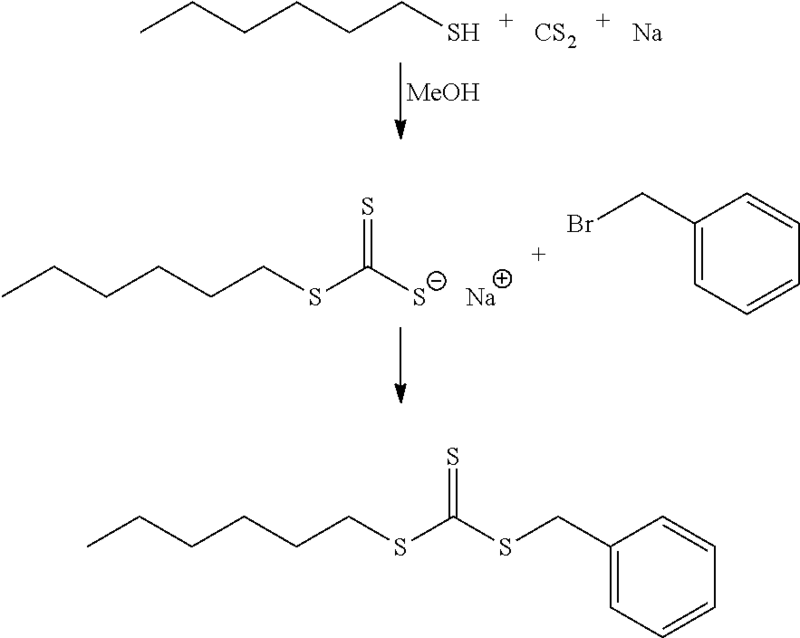 5,070,215, and the hydrophilic oxazolone monomers disclosed in U.S. Pat. No. 4,910,277 may also be used. wherein, R1 is hydrogen or methyl; at least one of R14 and R15 is substituted with a C1-C20 alkyl substituted with at least one hydroxyl group, with the proviso that when i) one of R14 and R15 is hydrogen, ii) the other of R14 and R15 is a C1-C20 alkyl group substituted with two or more hydroxyl groups. In one embodiment, the non-silicone (meth)acrylamide monomer comprises two or more hydroxyl groups in the molecule. In some embodiments R1 is a hydrogen atom and at least one of R14 and R15 is selected from hydrogen, optionally substituted C1-C20 alkyl group, or optionally substituted C6-C20 aryl group with the proviso that the total number of hydroxyl groups in R14 and R15 is two or more. In one embodiment R14 and R15 is are independently selected from C1-C10 alkyl group which may be substituted with at least one more hydroxyl group, and in other embodiments C1-C6 alkyl group which may be substituted with at least one more hydroxyl group, so long as the hydrophilic (meth)acrylamide meets the proviso above. Examples of R14 and R15 include hydrogen atoms, methyl groups, ethyl groups, propyl groups, n-propyl groups, i-propyl groups, n-butyl groups, s-butyl groups, t-butyl groups, n-pentyl groups, i-pentyl groups, s-pentyl groups, neopentyl groups, hexyl groups, heptyl groups, octyl groups, nonyl groups, decyl groups, dodecyl groups, eicosyl groups, phenyl groups, naphthyl groups, 2-hydroxyethyl groups, 2-hydroxypropyl groups, 3-hydroxypropyl groups, 2,3-dihydroxypropyl groups, 4-hydroxy butyl groups, 2-hydroxy-1,1-bis(hydroxymethyl)ethyl groups, 2-hydroxymethylphenyl groups, 3-hydroxymethylphenyl groups, 4-hydroxymethylphenyl groups and the like. These alkyl and hydroxyalkyl groups can be straight or branched. A particularly preferable example of a non-silicone type (meth)acrylamide monomer containing two or more hydroxyl groups in the molecule include the monomers expressed by the following general formulae (c1) through (c3). In chemical formulae (c1) through (c3), R1 independently represents a hydrogen atom or a methyl group. In another embodiment, the hydroxyl-containing (meth)acrylamide monomer comprises one hydroxyl group and no amide hydrogen in the molecule. In chemical formula (c0) of this embodiment, R1 represents methyl and R14 and R15 are independently selected from optionally substituted C1-C20 alkyl group, or optionally substituted C6-C20 aryl group with the proviso that one of R14 and R15 is substituted with at least one hydroxyl group. Examples of R14 and R15 include methyl groups, ethyl groups, propyl groups, n-propyl groups, i-propyl groups, n-butyl groups, s-butyl groups, t-butyl groups, n-pentyl groups, i-pentyl groups, s-pentyl groups, neopentyl groups, hexyl groups, heptyl groups, octyl groups, nonyl groups, decyl groups, dodecyl groups, eicosyl groups, phenyl groups, naphthyl groups, 2-hydroxyethyl groups, 2-hydroxypropyl groups, 3-hydroxypropyl groups, 4-hydroxy butyl groups, 2-hydroxymethylphenyl groups, 3-hydroxymethylphenyl groups, 4-hydroxymethylphenyl groups and the like. These alkyl groups can be straight or branched. Examples of hydroxyl-containing acrylamide monomer of this embodiment include the monomers expressed by the following general formulae (c11) through (c13). In chemical formulae (c11) through (c13), R1 independently represents a methyl group. In some embodiments acrylamide monomer comprising one hydroxyl group and one amide hydrogen in the molecule may be used. Examples of a mono-hydroxyl functionalized acrylamide monomer include N-(mono-hydroxyl substituted C1-C20 alkyl)acrylamide and N-(mono-hydroxyl substituted C6-C20 aryl)acrylamide. More specific examples include N-(2-hydroxyethyl)acrylamide, N-(2-hydroxypropyl)acrylamide, N-(3-hydroxypropyl)acrylamide, N-(2-hydroxybutyl)acrylamide, N-(3-hydroxybutyl)acrylamide, N-(4-hydroxy butyl)acrylamide, N-(2-hydroxymethylphenyl)acrylamide, N-(3-hydroxymethylphenyl)acrylamide, N-(4-hydroxymethylphenyl)acrylamide and the like. In some embodiments, N-(mono-hydroxyl substituted C2-C4 alkyl)acrylamide and particularly N-(2-hydroxyethyl)acrylamide may be preferred. The amount of the anionic monomer is also important. Even when a desirable charge distribution has been achieved, if the concentration of the anionic monomer is too high, undesirable PQ-1 uptake may occur. Thus, in embodiment, where the anionic monomer is a component of a reusable silicone hydrogel contact lens, the anionic monomer may be included in amounts up to about 5 mol %, in some embodiments between about 0.1 and about 5 mol %, between about 0.1 and about 4 mol %, and in other embodiments between about 0.2 and about 4 mol %. In embodiments where the contact lens is worn for only a single day and then thrown away, higher amounts of the anionic monomer may be included. The upper limit for the anionic monomer in these embodiments may be selected to provide the desired level of lysozyme or other team components, and a water content of less than about 70% water, in some embodiments less than 70% water, and in others less than about 65% water. The anionic monomer and non-ionic hydrophilic monomer may be copolymerized (either alone or with additional components) to form a water soluble, uncrosslinked polymer or may be included in a silicone hydrogel reaction mixture and cured to form the silicone hydrogel contact lens. When the anionic monomer and non-ionic, hydrophilic monomer are copolymerized to form an uncrosslinked statistical copolymer, the anionic monomer is present in the uncrosslinked statistical copolymer in amounts between about 20 to about 80 mol %, and in some embodiments between about 20 to about 60 mol %. The non-ionic, hydrophilic monomer may be present in amounts between about 80 to about 20 mol % and in some embodiments between about 80 to about 40 mol %. If the polymer contains a hydrophobic segment or block, as described below, these mol % are based upon the hydrophilic segment of the polymer only. The hydrophilic segment of the uncrosslinked statistical copolymers of the present invention have a degree of polymerization of at least about 300. The uncrosslinked statistical copolymers may be formed by a number of methods including, but not limited to, step growth polymerization, such as thiol-ene chemistry, and chain reaction polymerization, such as free radical polymerization and RAFT. In one embodiment the uncrosslinked statistical copolymer further comprises a hydrophobic block on at least one terminal end of the uncrosslinked statistical copolymer. The hydrophobic block may be a hydrocarbon block, a siloxane block, or any other block which is capable of associating with the silicone hydrogel contact lens. In another embodiment the uncrosslinked statistical copolymer has a hydrophobic block which is capable of associating with another polymeric biomedical device such as a stent, a rigid contact lens, a catheter, stent or other implant. In one embodiment, the hydrophobic block comprises polydialkylsiloxane, polydiarylsiloxane and mixtures thereof. The alkyls may be independently selected from C1-C4 alkyl, and in one embodiment the hydrophobic block comprises polydimethylsiloxane or polydiethylsiloxane, either of which may be terminated by a C1-12 alkyl, C1-C4alkyl, aryl or in some embodiments methyl or n-butyl. The hydrophobic block may comprise between about 6 and about 200 siloxy units, between about 6 and about 60 siloxy units, 6 and about 20 siloxy units, 6-15 siloxy units and 6 to 12 siloxy units. The uncrosslinked, statistical copolymers may be dissolved in solutions which swell the medical device and contacted with the medical device. In one embodiment where the device is a silicone hydrogel contact lens the uncrosslinked, statistical copolymers are dissolved in water or an aqueous solution and contacted with the contact lens during processing, packaging or cleaning or storage of the lens. For example the uncrosslinked, statistical copolymers may be incorporated into a hydration or packaging solution or may be included in a multipurpose or cleaning solution which is used by the contact lens wearer. The amount of uncrosslinked, statistical copolymers included in the solutions will depend in part on the concentration of the anionic monomer in the uncrosslinked, statistical copolymers. For example, uncrosslinked, statistical copolymers containing 30 mol % anionic monomer can be added in higher amounts than uncrosslinked, statistical copolymers having 80 mol % anionic monomer, as is shown the Examples. It is desirable to balance the concentration of anionic monomer in the uncrosslinked, statistical copolymers with the concentration of uncrosslinked, statistical copolymers in the solution to achieve the desired levels of lysozyme and PQ1 uptake. Concentrations of uncrosslinked, statistical copolymers of up to about 2000 ppm, and in some embodiments between about 20 ppm and 2000 ppm and in other embodiments between about 50 and about 1500 ppm are desirable. In another embodiment the anionic monomer and the non-ionic hydrophilic monomer are included in the silicone hydrogel reactive mixture to form a silicone hydrogel polymer having a homogeneously distributed anionic charge throughout the polymer. In this embodiment the resulting contact lens has a contact angle of less than about 70°, less than about 50° and in some embodiments less than about 30° all as measured by sessile drop. In this embodiment substantially all of the polymerizable components in the reaction mixture have the same reactive functionality. Non-reactive components, such as wetting agents may also be present. Contact lens formulations may contain small amounts of components, such as, but not limited to handling tints and UV absorbers, which because of their small concentration, do not need to have the same reactive functionality. Generally, the concentration of reactive components in the reaction mixture which have different functionality should be limited to less than about 0.5 mol %. Non-reactive components, such as non-reactive wetting agents may be present in greater amounts (up about 15 weight %, and in some embodiments up to about 20 weight %) as they do not participate in the reaction. In this embodiment the anionic monomer is present in the reactive mixture in concentrations in amounts up to about 5 mol %, in some embodiments between about 0.1 and about 5 mol %, between about 0.1 and about 4 mol %, and in other embodiments between about 0.2 and about 4 mol %. The non-ionic hydrophilic monomer is present in amounts of at least about 10 wt %, and in some embodiments between about 10 wt % and about 70 wt %, between about 20 and about 60% and in other embodiments, between about 20 and about 50 weight %. The reaction mixture further comprises at least one silicone-containing component. A silicone-containing component is one that contains at least one [—Si—O—] group, in a monomer, macromer or prepolymer. In one embodiment, the Si (silicon) and attached O are present in the silicone-containing component in an amount greater than 20 weight percent, and in another embodiment greater than 30 weight percent of the total molecular weight of the silicone-containing component. Useful silicone-containing components comprise polymerizable functional groups such as (meth)acrylate, (meth)acrylamide, N-vinyl lactam, N-vinylamide, and styryl functional groups. Examples of silicone-containing components which are useful in this invention may be found in U.S. Pat. Nos. 3,808,178; 4,120,570; 4,136,250; 4,153,641; 4,740,533; 5,034,461 and 5,070,215, and EP080539. All of the patents cited herein are hereby incorporated in their entireties by reference. These references disclose many examples of olefinic silicone-containing components. wherein at least one R1 comprises at least one monovalent reactive group, and in some embodiments between one and 3 R1 comprise monovalent reactive groups. As used herein “monovalent reactive groups” are groups that can undergo polymerization such as free radical, anionic and/or cationic polymerization. Non-limiting examples of free radical reactive groups include (meth)acrylates, styryls, vinyls, vinyl ethers, substituted or unsubstituted C1-6alkyl(meth)acrylates, (meth)acrylamides, substituted or unsubstituted C1-6alkyl(meth)acrylamides, N-vinyllactams, N-vinylamides, C2-12alkenyls, C2-12alkenylphenyls, C2-12alkenylnaphthyls, C2alkenylphenylC1-6alkyls, O-vinylcarbamates and O-vinylcarbonates. Suitable substituents on said C1-6 alkyls include ethers, hydroxyls, carboxyls, halogens and combinations thereof. Non-limiting examples of cationic reactive groups include vinyl ethers or epoxide groups and mixtures thereof. In one embodiment the free radical reactive groups comprises (meth)acrylate, acryloxy, (meth)acrylamide, and mixtures thereof. Suitable monovalent alkyl and aryl groups include unsubstituted monovalent C1 to C16alkyl groups, C6-C14 aryl groups, such as substituted and unsubstituted methyl, ethyl, propyl, butyl, 2-hydroxypropyl, propoxypropyl, polyethyleneoxypropyl, combinations thereof and the like. In one embodiment on R1 is selected from C1-6alkyl(meth)acrylates, and C1-6alkyl(meth)acrylamides, which may be unsubstituted or substituted with hydroxyl, alkylene ether or a combination thereof. In another embodiment R1 is selected from propyl(meth)acrylates and propyl(meth)acrylamides, wherein said propyl may be optionally substituted with hydroxyl, alkylene ether or a combination thereof. In one embodiment b is zero, one R1 is a monovalent reactive group, and at least 3 R1 are selected from monovalent alkyl groups having one to 16 carbon atoms, and in another embodiment from monovalent alkyl groups having one to 6 carbon atoms. Non-limiting examples of silicone components of this embodiment include 2-methyl-, 2-hydroxy-3-[3-[1,3,3,3-tetramethyl-1-[(trimethylsilyl)oxy]disiloxanyl]propoxy]propyl ester (“SiGMA”), 2-hydroxy-3-methacryloxypropyloxypropyl-tris(trimethylsiloxy)silane, 3-methacryloxypropyltris(trimethylsiloxy)silane (“TRIS”), 3-methacryloxypropylbis(trimethylsiloxy)methylsilane and 3-methacryloxypropylpentamethyl disiloxane. In another embodiment b is 5 to 400 or from 10 to 300, both terminal R1 comprise monovalent reactive groups and the remaining R1 are independently selected from monovalent alkyl groups having 1 to 18 carbon atoms which may have ether linkages between carbon atoms and may further comprise halogen. R denotes, hydrogen or methyl; d is 1, 2, 3 or 4; and q is 0 or 1. In another embodiment, where an acrylamide system is used, the (meth)acrylamide silicones of US2011/0237766 may be used with acrylamide hydrophilic monomers such as DMA and HEAA and acrylamide anionic monomers such as 3-acrylamidopropanoic acid (ACA1) or 5-acrylamidopentanoic acid (ACA2). Where biomedical devices with modulus below about 200 are desired, only one R1 shall comprise a monovalent reactive group and no more than two of the remaining R1 groups will comprise monovalent siloxane groups. In one embodiment, where a silicone hydrogel lens is desired, the lens of the present invention will be made from a reactive mixture comprising at least about 20 weight % and in some embodiments between about 20 and 70% wt silicone-containing components based on total weight of reactive monomer components from which the polymer is made. wherein: R12 is hydrogen or methyl; R13 is hydrogen, an alkyl radical having 1 to 6 carbon atoms, or a —CO—Y—R15 radical wherein Y is —O—, Y—S— or —NH—; R14 is a divalent radical having 1 to 12 carbon atoms; X denotes —CO— or —OCO—; Z denotes —O— or —NH—; Ar denotes an aromatic radical having 6 to 30 carbon atoms; w is 0 to 6; x is 0 or 1; y is 0 or 1; and z is 0 or 1.
wherein R16 is a diradical of a diisocyanate after removal of the isocyanate group, such as the diradical of isophorone diisocyanate. Another suitable silicone containing macromer is compound of formula X (in which x+y is a number in the range of 10 to 30) formed by the reaction of fluoroether, hydroxy-terminated polydimethylsiloxane, isophorone diisocyanate and isocyanatoethylmethacrylate. Other silicone-containing components suitable for use in this invention include those described is WO 96/31792 such as macromers containing polysiloxane, polyalkylene ether, diisocyanate, polyfluorinated hydrocarbon, polyfluorinated ether and polysaccharide groups. Another class of suitable silicone-containing components includes silicone containing macromers made via GTP, such as those disclosed in U.S. Pat. Nos. 5,314,960, 5,331,067, 5,244,981, 5,371,147 and 6,367,929. U.S. Pat. Nos. 5,321,108; 5,387,662 and 5,539,016 describe polysiloxanes with a polar fluorinated graft or side group having a hydrogen atom attached to a terminal difluoro-substituted carbon atom. 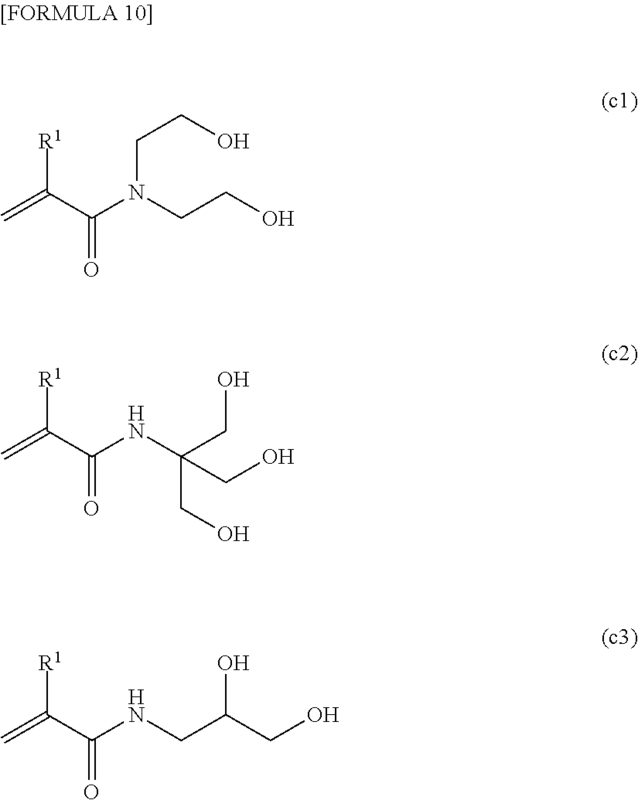 US 2002/0016383 describe hydrophilic siloxanyl methacrylates containing ether and siloxanyl linkanges and crosslinkable monomers containing polyether and polysiloxanyl groups. Any of the foregoing polysiloxanes can also be used as the silicone-containing component in this invention. In one embodiment of the present invention where a modulus of less than about 120 psi is desired, the majority of the mass fraction of the silicone-containing components used in the lens formulation should contain only one polymerizable functional group (“monofunctional silicone containing component”). In this embodiment, to insure the desired balance of oxygen transmissibility and modulus it is preferred that all components having more than one polymerizable functional group (“multifunctional components”) make up no more than 10 mmol/100 g of the reactive components, and preferably no more than 7 mmol/100 g of the reactive components. In another embodiment, the reaction mixtures are substantially free of silicone containing components which contain trimethylsiloxy groups. The silicone containing components may be present in amounts up to about 85 weight %, and in some embodiments between about 10 and about 80 and in other embodiments between about 20 and about 70 weight %, based upon all reactive components. Other components that can be present in the reaction mixture used to form the contact lenses of this invention include wetting agents, such as those disclosed in U.S. Pat. No. 6,367,929, WO03/22321, WO03/22322, compatibilizing components, such as those disclosed in US2003/162862 and US2003/125498, ultra-violet absorbing compounds, medicinal agents, antimicrobial compounds, copolymerizable and nonpolymerizable dyes, including photochromic dyes, release agents, reactive tints, pigments, pharmaceutical and nutriceutical compounds, combinations thereof and the like. The sum of additional components may be up to about 20 wt %. In one embodiment the reaction mixtures comprise up to about 18 wt % wetting agent, and in another embodiment, between about 5 and about 18 wt % wetting agent. A polymerization catalyst may be included in the reaction mixture. The polymerization initiators includes compounds such as lauroyl peroxide, benzoyl peroxide, isopropyl percarbonate, azobisisobutyronitrile, and the like, that generate free radicals at moderately elevated temperatures, and photoinitiator systems such as aromatic alpha-hydroxy ketones, alkoxyoxybenzoins, acetophenones, acylphosphine oxides, bisacylphosphine oxides, and a tertiary amine plus a diketone, mixtures thereof and the like. Illustrative examples of photoinitiators are 1-hydroxycyclohexyl phenyl ketone, 2-hydroxy-2-methyl-1-phenyl-propan-1-one, bis(2,6-dimethoxybenzoyl)-2,4-4-trimethylpentyl phosphine oxide (DMBAPO), bis(2,4,6-trimethylbenzoyl)-phenyl phosphineoxide (Irgacure 819), 2,4,6-trimethylbenzyldiphenyl phosphine oxide and 2,4,6-trimethylbenzoyl diphenylphosphine oxide, benzoin methyl ester and a combination of camphorquinone and ethyl 4-(N,N-dimethylamino)benzoate. Commercially available visible light initiator systems include Irgacure 819, Irgacure 1700, Irgacure 1800, Irgacure 819, Irgacure 1850 (all from Ciba Specialty Chemicals) and Lucirin TPO initiator (available from BASF). Commercially available UV photoinitiators include Darocur 1173 and Darocur 2959 (Ciba Specialty Chemicals). These and other photoinitators which may be used are disclosed in Volume III, Photoinitiators for Free Radical Cationic & Anionic Photopolymerization, 2nd Edition by J. V. Crivello & K. Dietliker; edited by G. Bradley; John Wiley and Sons; New York; 1998. The initiator is used in the reaction mixture in effective amounts to initiate photopolymerization of the reaction mixture, e.g., from about 0.1 to about 2 parts by weight per 100 parts of reactive monomer. Polymerization of the reaction mixture can be initiated using the appropriate choice of heat or visible or ultraviolet light or other means depending on the polymerization initiator used. Alternatively, initiation can be conducted without a photoinitiator using, for example, e-beam. However, when a photoinitiator is used, the preferred initiators are bisacylphosphine oxides, such as bis(2,4,6-trimethylbenzoyl)-phenyl phosphine oxide (Irgacure 819®) or a combination of 1-hydroxycyclohexyl phenyl ketone and bis(2,6-dimethoxybenzoyl)-2,4-4-trimethylpentyl phosphine oxide (DMBAPO), and in another embodiment the method of polymerization initiation is via visible light activation. A preferred initiator is bis(2,4,6-trimethylbenzoyl)-phenyl phosphine oxide (Irgacure 819®). The reactive components (silicone containing component, hydrophilic monomers, wetting agents, and other components which are reacted to form the lens) are mixed together either with or without a diluent to form the reaction mixture. In one embodiment a diluent is used having a polarity sufficiently low to solubilize the non-polar components in the reactive mixture at reaction conditions. One way to characterize the polarity of the diluents of the present invention is via the Hansen solubility parameter, δp. In certain embodiments, the Sp is less than about 10, and preferably less than about 6. Suitable diluents are further disclosed in U.S. Ser. No. 60/452,898 and U.S. Pat. No. 6,020,445. Classes of suitable diluents include, without limitation, alcohols having 2 to 20 carbons, amides having 10 to 20 carbon atoms derived from primary amines, ethers, polyethers, ketones having 3 to 10 carbon atoms, and carboxylic acids having 8 to 20 carbon atoms. For all solvents, as the number of carbons increase, the number of polar moieties may also be increased to provide the desired level of water miscibility. In some embodiments, primary and tertiary alcohols are preferred. Preferred classes include alcohols having 4 to 20 carbons and carboxylic acids having 10 to 20 carbon atoms. In one embodiment the diluents are selected from 1,2-octanediol, t-amyl alcohol, 3-methyl-3-pentanol, decanoic acid, 3,7-dimethyl-3-octanol, tripropylene glycol methyl ether (TPME), butoxy ethyl acetate, mixtures thereof and the like. In one embodiment the diluents are selected from diluents that have some degree of solubility in water. In some embodiments at least about three percent of the diluent is miscible water. Examples of water soluble diluents include 1-octanol, 1-pentanol, 1-hexanol, 2-hexanol, 2-octanol, 3-methyl-3-pentanol, 2-pentanol, t-amyl alcohol, tert-butanol, 2-butanol, 1-butanol, 2-methyl-2-pentanol, 2-ethyl-1-butanol, ethanol, 3,3-dimethyl-2-butanol, decanoic acid, octanoic acid, dodecanoic acid, 1-ethoxy-2-propanol, 1-tert-butoxy-2-propanol, EH-5 (commercially available from Ethox Chemicals), 2,3,6,7-tetrahydroxy-2,3,6,7-tetramethyl octane, 9-(1-methylethyl)-2,5,8,10,13,16-hexaoxaheptadecane, 3,5,7,9,11,13-hexamethoxy-1-tetradecanol, mixtures thereof and the like. The reactive mixture of the present invention may be cured via any known process for molding the reaction mixture in the production of contact lenses, including spincasting and static casting. Spincasting methods are disclosed in U.S. Pat. Nos. 3,408,429 and 3,660,545, and static casting methods are disclosed in U.S. Pat. Nos. 4,113,224 and 4,197,266. In one embodiment, the contact lenses of this invention are formed by the direct molding of the silicone hydrogels, which is economical, and enables precise control over the final shape of the hydrated lens. For this method, the reaction mixture is placed in a mold having the shape of the final desired silicone hydrogel, i.e. water-swollen polymer, and the reaction mixture is subjected to conditions whereby the monomers polymerize, to thereby produce a polymer in the approximate shape of the final desired product. After curing the lens is subjected to extraction to remove unreacted components and release the lens from the lens mold. The extraction may be done using conventional extraction fluids, such as organic solvents, such as alcohols or may be extracted using aqueous solutions. Aqueous solutions are solutions which comprise water. In one embodiment the aqueous solutions of the present invention comprise at least about 30% water, in some embodiments at least about 50% water, in some embodiments at least about 70% water and in others at least about 90 weight % water. Aqueous solutions may also include additional water soluble components such as the uncrosslinked statistical copolymers of the present invention, release agents, wetting agents, slip agents, pharmaceutical and nutraceutical components, combinations thereof and the like. Release agents are compounds or mixtures of compounds which, when combined with water, decrease the time required to release a contact lens from a mold, as compared to the time required to release such a lens using an aqueous solution that does not comprise the release agent. In one embodiment the aqueous solutions comprise less than about 10 weight %, and in others less than about 5 weight % organic solvents such as isopropyl alcohol, and in another embodiment are free from organic solvents. In these embodiments the aqueous solutions do not require special handling, such as purification, recycling or special disposal procedures. In various embodiments, extraction can be accomplished, for example, via immersion of the lens in an aqueous solution or exposing the lens to a flow of an aqueous solution. In various embodiments, extraction can also include, for example, one or more of: heating the aqueous solution; stirring the aqueous solution; increasing the level of release aid in the aqueous solution to a level sufficient to cause release of the lens; mechanical or ultrasonic agitation of the lens; and incorporating at least one leach aid in the aqueous solution to a level sufficient to facilitate adequate removal of unreacted components from the lens. The foregoing may be conducted in batch or continuous processes, with or without the addition of heat, agitation or both. Some embodiments can also include the application of physical agitation to facilitate leach and release. For example, the lens mold part to which a lens is adhered, can be vibrated or caused to move back and forth within an aqueous solution. Other embodiments may include ultrasonic waves through the aqueous solution. These and other similar processes can provide an acceptable means of releasing the lens. As used herein, “released from a mold” means that a lens is either completely separated from the mold, or is only loosely attached so that it can be removed with mild agitation or pushed off with a swab. In the process of the present invention the conditions used include temperature less than 99° C. for less than about 1 hour. The lenses may be sterilized by known means such as, but not limited to autoclaving. The uncrosslinked, statistical copolymers may be added before or after polymerization. In one embodiment, ophthalmic devices formed from the polymers of the present invention display excellent compatibility with the components of human tears. Human tears are complex and contain a mixture of proteins, lipids and other components which help to keep the eye lubricated. Examples of proteins which are found in human tears include lactoferrin, lysozyme, lipocalin, serum albumin, and secretory immunoglobulin A.
Lysozyme is generally present in human tears in substantial concentrations. Lysozyme is bacteriolytic and believed to protect the eye against bacterial infection. The amount of lysozyme which associates with commercially available contact lenses when worn, varies greatly from only a few micrograms to over 800 micrograms for etafilcon A contact lenses (commercially available from Johnson & Johnson Vision Care, Inc., under the ACUVUE and ACUVUE2 brand names). Etafilcon A contact lenses have been commercially available for many years and display some of the lowest adverse event rates of any soft contact lens. Thus, contact lenses which uptake substantial levels of lysozyme are desirable. The lenses of the present invention uptake at least about 50 μg, 100 μg, 200 μg, 500 μg of lysozyme and in some embodiments at least about 800 μg lysozyme, all from a 2 mg/ml solution over 72 hours incubation at 35° C. In another embodiment the silicone hydrogels of the present invention display both desirable lysozyme uptake and water content. Desirable water contents are those between about 20 and about 70%, between about 25 and about 70%, and in some embodiments between about 25 and about 65 wt %. The foregoing ranges may be combined in any variation. In addition to lysozyme, lactoferrin is another important cationic protein in the tears, mainly by the virtue of its anti-bacterial and anti-inflammatory properties. Upon wear, contact lenses uptake various amounts of lactoferrin, depending upon their polymer composition (for non-surface modified lenses) and the composition and integrity of the surface coating (for surface modified contact lenses). In one embodiment of the present invention, lenses uptake at least about 5 μg, and in some embodiments, at least about 10 micrograms lactoferrin following overnight soaking of the lenses in 2 mls of a 2 mg/ml lactoferrin solution. The lactoferrin solution contains lactoferrin from human milk (Sigma L-0520) solubilized at a concentration of 2 mg/ml in phosphate saline buffer. Lenses are incubated in 2 ml of the lactoferrin solution per lens for 72 hours at 35° C., using the procedure described below for lysozyme. Lactoferrin and lysozyme also act synergistically as bactericidal agents. The form of the proteins in, on and associated with the lens is also important. Denatured proteins are believed to contribute to corneal inflammatory events and wearer discomfort. Environmental factors such as pH, ocular surface temperature, wear time and closed eye wear are believed to contribute to the denaturation of proteins. However, lenses of different compositions can display markedly different protein uptake and denaturation profiles. In one embodiment of the present invention, a majority of the proteins uptaken by the lenses of the present invention are and remain in the native form during wear. In other embodiments at least about 50%, at least about 70 and at least about 80% of uptaken proteins are and remain native after 24 hours, 3 days and during the intended wear period. In one embodiment the ophthalmic devices of the present invention also uptake less than about 20%, in some embodiments less than about 10%, and in other embodiments less than about 5% Polyquaternium-1 (“PQ1”) from an ophthalmic solution containing 0.001 wt % PQ1 and citrate dihydrate and citric acid monohydrate. The lenses of the present invention have a number of desirable properties in addition to the protein uptake characteristics described herein. In one embodiment the lenses have an oxygen permeability greater than about 50 and in other embodiments greater than about 60, in other embodiments greater than about 80 and in still other embodiments at least about 100. In some embodiments the lenses have tensile moduli less than about 100 psi. The biomedical devices, and particularly ophthalmic lenses of the present invention have a balance of properties which makes them particularly useful. Such properties include clarity, water content, oxygen permeability and contact angle. Silicone hydrogel contact lenses formed from the polymers of the present invention display contact angles of less than about 70°, less than about 50° and in some embodiments less than about 30° all as measured by sessile drop, and decreases in contact angle of about 30% and in some embodiments about 50% or more. In one embodiment, the biomedical devices are contact lenses having a water content of greater than about 20% and more preferably greater than about 25%. As used herein clarity means substantially free from visible haze. Preferably clear lenses have a haze value of less than about 150%, more preferably less than about 100%. Suitable oxygen permeabilities for silicone containing lenses are preferably greater than about 40 barrer and more preferably greater than about 60 barrer. In some embodiments the articles of the present invention have combinations of the above described oxygen permeability, water content and contact angle. All combinations of the above ranges are deemed to be within the present invention. It will be appreciated that all of the tests specified herein have a certain amount of inherent test error. Accordingly, results reported herein are not to be taken as absolute numbers, but numerical ranges based upon the precision of the particular test. Wettability of lenses was determined using a sessile drop technique measured using KRUSS DSA-100™ instrument at room temperature and using DI water as probe solution. The lenses to be tested (3-5/sample) were rinsed in DI water to remove carry over from packing solution. Each test lens was placed on blotting lint free wipes which were dampened with packing solution. Both sides of the lens were contacted with the wipe to remove surface water without drying the lens. To ensure proper flattening, lenses were placed “bowl side down” on the convex surface on contact lens plastic moulds. The plastic mould and the lens were placed in the sessile drop instrument holder, ensuring proper central syringe alignment and that the syringe corresponds to the assigned liquid. A 3 to 4 microliter of DI water drop was formed on the syringe tip using DSA 100-Drop Shape Analysis software ensuring the liquid drop was hanging away from the lens. The drop was released smoothly on the lens surface by moving the needle down. The needle was withdrawn away immediately after dispensing the drop. The liquid drop was allowed to equilibrate on the lens for 5 to 10 seconds and the contact angle was measured between the drop image and the lens surface. The water content may be measured as follows: lenses to be tested were allowed to sit in packing solution for 24 hours. Each of three test lens were removed from packing solution using a sponge tipped swab and placed on blotting wipes which have been dampened with packing solution. Both sides of the lens were contacted with the wipe. Using tweezers, the test lens were placed in a weighing pan and weighed. The two more sets of samples were prepared and weighed as above. The pan was weighed three times and the average is the wet weight. The average and standard deviation of the water content are calculated for the samples are reported. Haze may measured by placing a hydrated test lens in borate buffered saline in a clear 20×40×10 mm glass cell at ambient temperature above a flat black background, illuminating from below with a fiber optic lamp (Titan Tool Supply Co. fiber optic light with 0.5″ diameter light guide set at a power setting of 4-5.4) at an angle 66° normal to the lens cell, and capturing an image of the lens from above, normal to the lens cell with a video camera (DVC 1300C:19130 RGB camera with Navitar TV Zoom 7000 zoom lens) placed 14 mm above the lens platform. The background scatter is subtracted from the scatter of the lens by subtracting an image of a blank cell using EPIX XCAP V 1.0 software. The subtracted scattered light image is quantitatively analyzed, by integrating over the central 10 mm of the lens, and then comparing to a −1.00 diopter CSI Thin Lens®, which is arbitrarily set at a haze value of 100, with no lens set as a haze value of 0. Five lenses are analyzed and the results are averaged to generate a haze value as a percentage of the standard CSI lens. Oxygen permeability (Dk) may be determined by the polarographic method generally described in ISO 9913-1: 1996(E), but with the following variations. The measurement is conducted at an environment containing 2.1% oxygen. This environment is created by equipping the test chamber with nitrogen and air inputs set at the appropriate ratio, for example 1800 ml/min of nitrogen and 200 ml/min of air. The t/Dk is calculated using the adjusted pO2. Borate buffered saline was used. The dark current was measured by using a pure humidified nitrogen environment instead of applying MMA lenses. The lenses were not blotted before measuring. Four lenses were stacked instead of using lenses of varied thickness. A curved sensor was used in place of a flat sensor. The resulting Dk value is reported in barrers. Lysozyme uptake was measured as follows: The lysozyme solution used for the lysozyme uptake testing contained lysozyme from chicken egg white (Sigma, L7651) solubilized at a concentration of 2 mg/ml in phosphate saline buffer supplemented by Sodium bicarbonate at 1.37 g/l and D-Glucose at 0.1 g/1. Three lenses for each example were tested using each protein solution, and three were tested using PBS as a control solution. The test lenses were blotted on sterile gauze to remove packing solution and aseptically transferred, using sterile forceps, into sterile, 24 well cell culture plates (one lens per well) each well containing 2 ml of lysozyme solution. Each lens was fully immersed in the solution. 2 ml of the lysozyme solution was placed in a well without a contact lens as a control. The plates containing the lenses and the control plates containing only protein solution and the lenses in the PBS, were sealed using parafilm to prevent evaporation and dehydration, placed onto an orbital shaker and incubated at 35° C., with agitation at 100 rpm for 72 hours. After the 72 hour incubation period the lenses were rinsed 3 to 5 times by dipping lenses into three (3) separate vials containing approximately 200 ml volume of PBS. The lenses were blotted on a paper towel to remove excess PBS solution and transferred into sterile conical tubes (1 lens per tube), each tube containing a volume of PBS determined based upon an estimate of lysozyme uptake expected based upon on each lens composition. The lysozyme concentration in each tube to be tested needs to be within the albumin standards range as described by the manufacturer (0.05 micogram to 30 micrograms). Samples known to uptake a level of lysozyme lower than 100 μg per lens were diluted 5 times. Samples known to uptake levels of lysozyme higher than 500 μg per lens (such as etafilcon A lenses) are diluted 20 times. 1 ml aliquot of PBS was used for all samples other than etafilcon. 20 ml were used for etafilcon A lens. Each control lens was identically processed, except that the well plates contained PBS instead of lysozyme solution. Lysozyme uptake was determined using on-lens bicinchoninic acid method using QP-BCA kit (Sigma, QP-BCA) following the procedure described by the manufacturer (the standards prep is described in the kit) and is calculated by subtracting the optical density measured on PBS soaked lenses (background) from the optical density determined on lenses soaked in lysozyme solution. Optical density was measured using a SynergyII Micro-plate reader capable for reading optical density at 562 nm. Three lenses were run for each analysis, and the results were averaged. The non-limiting examples below further describe this invention. was dissolved in approx. 250 mL of acetone in a 1 L round bottom flask. Sodium hexyltrithiocarbonate (NaHTTC) was dissolved in 100 mL acetone and added to the reaction mixture. The reaction mixture was stirred overnight. A white solid precipitated out of the bright yellow solution. Acetone was removed via rotary-evaporation, and the crude product was partitioned between 250 mL DI water and 250 mL hexane. The hexane layer was separated out and the aqueous layer was extracted with hexane (3×200 mL). All organic layers were combined, washed with brine (250 mL) and dried over Na2SO4. The crude product in hexane was passed over a silica gel plug to remove cloudiness. Hexane was removed via rotary-evaporation leaving the product (XG-1996-HTTC) in the form of a clear yellow oil. Structure was confirmed using NMR spectroscopy. A fresh solution of sodium methoxide was prepared by dissolving 4.6 g of metallic sodium in 250 mL of stirred methanol, to which, Beta-alanine (3-aminopentanoic acid, 8.9 g, 0.1 mole) was added. Acryloyl chloride (10.0 g, 1.1 eq.) was added dropwise to a stirred suspension of the given mixture, while maintaining the temperature below 35 C at all times. The mixture was stirred for an additional 30 minutes, concentrated to about 50 mL and filtered to remove the sodium chloride formed. The hygroscopic product was treated with pH 3 aqueous HCl, followed by evaporation of the volatiles ad filtration through silica gel using 3-5% (v/v) methanol in ethyl acetate. A fresh solution of sodium methoxide was prepared by dissolving 5.76 g of metallic sodium in 250 mL of stirred methanol. Valeric acid (5-aminopentanoic acid, 14.68 g, 0.125 mole) was dissolved in the given solution and 2.1 g of sodium carbonate was added to the mixture. Acryloyl chloride (12.31 g, 1.1 eq.) was added dropwise to a stirred suspension of the given mixture, while maintaining the temperature below 35 C at all times. The mixture was stirred for an additional 30 minutes and filtered to remove the sodium chloride and residual carbonate present. Evaporation of the methanol and other volatiles at reduced pressure, followed by washing the residue with 2×75 mL of acetonitrile yielded 20.4 g of the sodium salt of 5-acrylamidopentanoic acid. The free carboxylic acid was obtained pure after acidification of the salt in pH 3 aqueous HCl, evaporation of the residual water, followed by filtration through silica gel using 2-3% (v/v) methanol in ethyl acetate. N,N-dimethylacrylamide (DMA) and further purified via vacuum distillation. 5-acrylamidopentanoic acid (ACA2) was prepared according to Synthesis 3 The siloxy-functional benzyltrithiocarbonate, S-XG-1996-S′-hexyl-trithiocarbonate, was prepared according to Synthesis 1, above. Irgacure 819 was dissolved in D30 (10 mg/mL). The polymerization solution was prepared by dissolving 1.1 g ACA2 in 3 mL of ethanol and 1.5 g DMA in an amber 20 mL glass vial. Next, 166 mg S-XG-1996-S′-hexyl-trithiocarbonate, and 1.51 mg (151 ul of stock solution) Irgacure-819 were added to the monomer and warmed/stirred to ensure homogeneity (CTA to initiator ratio=20). The amber vial containing the final polymerization solution was sealed with a rubber septum and purged for 20 minutes with N2 to remove O2 from the solution. Finally the sealed jar was placed in an N2 glove-box for storage. The polymerization_solution was cured under an N2 atmosphere with 4 standard Phillips TL 20W/03 RS bulbs at intensity of 2.0 mW/cm2 for 45 minutes. Prior to curing, the polymerization solution was poured into an 80 mm diameter crystallization dish, which was then placed on a reflective glass surface. After curing, the resulting highly viscous polymerized material was dissolved in 5 mL of ethanol. The solution was stirred then added drop-wise to vigorously stirring diethyl ether to precipitate product. A 500 mL flask filled with 200 mL of ether was used. The precipitated polymer was dried in vacuo for several hours. The polymer was analyzed for MW and MWD via SEC-MALLS. The degree of polymerization of the hydrophilic segment was about 300. The reaction is shown below. N,N-dimethylacrylamide (DMA) was purified via vacuum distillation. 5-acrylamidopentanoic acid (ACA2) was prepared according to Synthesis 3. The siloxy-functional benzyltrithiocarbonate, S-XG-1996-S′-hexyl-trithiocarbonate, was prepared according to Synthesis 1. Irgacure 819, was obtained from Ciba Specialty Chemicals and dissolved in D3O (10 mg/mL). The polymerization solution was prepared by dissolving 2.07 g ACA2 in 6 mL ethanol and 300 mg DMA in an amber 20 mL glass vial. Next, 58 mg S-XG-1996-S′-hexyl-trithiocarbonate, and 1.06 mg (106 ul of stock solution) Irgacure-819 were added to the monomer and warmed/stirred to ensure homogeneity (CTA to initiator ratio=20). The amber vial containing the final polymerization solution was sealed with a rubber septum and purged for 20 minutes with N2 to remove O2 from the solution. Finally the sealed vial was placed in an N2 glove-box for storage. The polymerization solution was cured and purified as described in Preparation 1. The polymer was analyzed for MW and MWD via SEC-MALLS. The degree of polymerization of the hydrophilic segment was about 300. N,N-dimethylacrylamide (DMA) was obtained from Jarchem and further purified via vacuum distillation. S-benzyl-S′-hexyl-trithiocarbonate was prepared according to Synthesis 1. Irgacure 819 (1.06 mg) was dissolved in D3O (10 mg/mL). The polymerization solution was prepared by dissolving the ACA2 in ethanol and DMA in an amber 20 mL glass vial. Next, S-benzyl-S′-hexyl-trithiocarbonate, and (1.51 ul of stock solution) Irgacure-819 were added to the monomer and warmed/stirred to ensure homogeneity (CTA to initiator ratio=20). The amounts for each component are shown in Table 2, above. The amber vial containing the final polymerization solution was sealed with a rubber septum and purged for 20 minutes with N2 to remove O2 from the solution. Finally the sealed jar was placed in an N2 glove-box for storage. The polymerization solution was cured under an N2 atmosphere with 4 standard Phillips TL 20W/03 RS bulbs at intensity of 2.0 mW/cm2 for 45 minutes. Prior to curing, the polymerization solution was poured into an 80 mm diameter crystallization dish, which was then placed on a reflective glass surface. The resulting polymerized material was dissolved in 5 mL of ethanol. The solution was stirred then added drop-wise to vigorously stirring diethyl ether to precipitate product. A 500 mL flask filled with 200 mL of ether was used. The precipitated polymer was dried in vacuo for several hours. The polymer was analyzed for MW and MWD via SEC-MALLS. The reaction is shown below. Three senofilcon lenses were removed from their packages and transferred glass vials containing packing solution containing the non-reactive polysiloxane terminated hydrophilic polymer (“NRPTHP”) produced in Preparation 1 through 4 in the concentrations shown in Table 1. The lenses were re-packaged in the NRPTHP packing solution, autoclaved at 121° C. for 28 minutes and, after sterilization, were allowed to soak in the NRPTHP packing solution at ambient temperature for at least 24 hours. The contact angle, lysozyme uptake and PQ-1 uptake of the lenses were measured and are reported in Table 3. Untreated senofilcon lenses were also tested as a control. The data in Table 3 shows that non-reactive hydrophilic copolymers comprising a randomly copolymerized anionic monomer are effective at reducing contact angle. The hydrophilic copolymer of Preparations 1 and 2 contained an anionic component, APA which in the concentrations of Examples 2 through 4 were effective in increasing lysozyme uptake to at least about 50 μg/lens and decreasing PQ1 uptake. Lysozyme is a protein native to the eye which, when uptaken in a contact lens in the native form, is believed to improve the biocompatibility of the contact lens. PQ1 is a preservative commonly used in contact lens multipurpose solutions. Uptake of PQ1 to a contact lens in amounts greater than about 10% can cause staining and is therefore undesirable. Examples 1-12 display lower values of PQ1 uptake compared to the lenses treated with acrylic acid containing polymers of Comparative Examples 1-4. The lenses of Examples 2-4 and 9 display a desirable balance of contact angle, lysozyme and PQ1 uptake. DMA was purified via vacuum distillation. Acrylic acid (Sigma Aldrich) was used as received. S-XG-1996-S′-hexyl-trithiocarbonate, was prepared according to Synthesis 1. Irgacure 819, was dissolved in decanol (10 mg/mL). The polymerization solution was prepared by adding distilled DMA and acrylic acid to an amber 30 mL glass jar. Next, pentanol, S-XG-1996-S′-hexyl-trithiocarbonate, and Irgacure-819 stock solution were added to the monomer in the amounts in Table 3a and warmed/stirred to ensure homogeneity (CTA to initiator ratio=100). The amber jar containing the final polymerization solution was sealed with a rubber septum and purged for 20 minutes with N2 to remove O2 from the solution. Finally the sealed jar was placed in an N2 glove-box for overnight storage. The polymerization solution was cured under an N2 atmosphere with 4 standard Phillips TL 20W/03 RS bulbs at intensity of 2.0 mW/cm2 for 1 hour. Prior to curing, the polymerization solution was poured into a 125 mm diameter crystallization dish, which was then placed on a reflective glass surface. After curing for 1 hour, the resulting highly viscous polymerized material was dissolved in 30 mL of ethanol. The solution was stirred overnight then transferred to an addition funnel using 20 mL of ethanol to rinse out the crystallization dish. The polymer solution was added drop-wise to vigorously stirring diethyl ether to precipitate product. A 1 L flask filled with 500 mL of ether was used. The precipitated polymer was dried in vacuo for several hours and then subjected to further purification via Soxhlet Extraction with diethyl ether. The polymer was analyzed for MW and MWD via SEC-MALLS. The amount of reactants are shown in Table 3b. The amount of reactants are shown in Table 3c. Sodium in kerosene (Sigma Aldrich) was added in pieces slowly under nitrogen to 20 mL of methanol to form sodium methoxide. This solution was added to a flask containing 1-hexanethiol (Sigma Aldrich) in several aliquots. Carbon disulfide (Sigma Aldrich) was added drop-wise via syringe. The solution turned yellow immediately. The solution was allowed to react for 15 minutes. Benzyl bromide (Sigma Aldrich) was then added dropwise via syringe. A precipitate formed immediately. The reaction was allowed to proceed for two hours. A yellow oil eventually formed at the bottom of the flask. The methanol was roto-vapped off and the product was separated from the sodium salt with deionized water and hexane. The aqueous layer was approximately 50 mL and was extracted three times with 50 mL of hexane. The hexane was combined, dried over Na2SO4 and evaporated to dryness under pressure. The reaction is shown below. DMA was purified via vacuum distillation. Acrylic acid (Sigma Aldrich) was used as received. S-benzyl-S′-hexyl-trithiocarbonate was prepared according to Procedure 1. Irgacure 819 was dissolved in decanol (10 mg/mL). The components were used in the amounts shown in Table 3d, below. The polymerization solutions were prepared for each of Preparation 5-7 by adding DMA and acrylic acid to an amber 30 mL glass jar. Next, ethanol, S-benzyl-S′-hexyl-trithiocarbonate (CTA), and Irgacure-819 were added to the monomer and warmed/stirred to ensure homogeneity (CTA to initiator ratio=100). The amber jar containing the final polymerization solution was sealed with a rubber septum and purged for 20 minutes with N2 to remove O2 from the solution. Finally the sealed jar was placed in an N2 glove-box for storage. The polymerization solution was cured under an N2 atmosphere with 4 standard Phillips TL 20W/03 RS bulbs at intensity of 2.0 mW/cm2. Prior to curing, the polymerization solution was poured into a 125 mm diameter crystallization dish, which was then placed on a reflective glass surface. No increase in viscosity was observed after 40 minutes under light. In each example another dose of Irgacur 819 equal to the initial dose was added to the dish lowering the CTA to initiator ratio to 50 to improve polymerization. The solution was mixed with swirling then exposed to light for another 30 minutes and became extremely viscous. After curing, the resulting polymerized material was dissolved in 40 mL of ethanol. The solution was stirred overnight then transferred to an addition funnel using 20 mL of ethanol to rinse out the crystallization dish. The polymer solution was added drop-wise to vigorously stirring diethyl ether to precipitate product. A 1 L flask filled with 800 mL of ether was used. The precipitated polymer was dried in vacuo for several hours and then subjected to further purification via Soxhlet Extraction with diethyl ether. The polymers were analyzed for MW and MWD via SEC-MALLS. A base reactive mixture having the components listed in Table 4, below was made by mixing the components in the amounts listed with t-amyl alcohol (55 wt % components:45 wt % t-amyl alcohol). Separate formulations were made adding 3 mol % of the ionic component listed in Table 5, below. The formulations were stirred on a jar roller for 2 hours, and then filtered. Each reactive mixture was degassed, dosed into molds (Zeonor FC/polypropylene BC) and cured for 5 minutes, at about 55° C., about 2.25 mW/cm2 intensity, and about 0.2% O2. The molds were separated by hand. The lenses were released and extracted in 70/30 IPA/DI and finally hydrated in standard packing solution. The lenses were sterilized at 121° C. for 20 minutes. The sterilized lenses were tested for lysozyme and PQI uptake. Comparative Example 5 were lenses made from the formulation in Table 4 without any ionic components added. Comparative Example 6 lenses were made from the formulation in Table 4 with 3% MAA as the ionic component. Comparative Examples 7 and 8 are made from the formulation in Table 6. The procedure for making the lenses of Comparative Examples 7 and 8 are described below. Comparative Example 6 is an ionic mixed methacrylate (MAA)/methacrylamide (SA2, bisHEAA, DMA, MBA) system. The addition of 3 mol % MAA greatly improved lysozyme uptake compared to Comparative Example 5, which is the same formulation without any ionic component. However, Comparative Example 6 displayed dramatically increased PQ1 uptake. Examples 13 and 14 contain ACA1 and ACA2 as the ionic component, both of which are acrylamides. They also display significantly improved lysozyme uptake, but show no increase in PQ1 uptake compared to Comparative Example 5. The lenses of the invention are formed from reaction mixtures comprising the same reactive functionality (in Examples 13-14, acrylamide). This provides a statistical copolymer with the anionic charge evenly distributed throughout the lens. It is believed that the desirable combination of properties results from this consistent distribution of charge throughout the lenses of the invention. 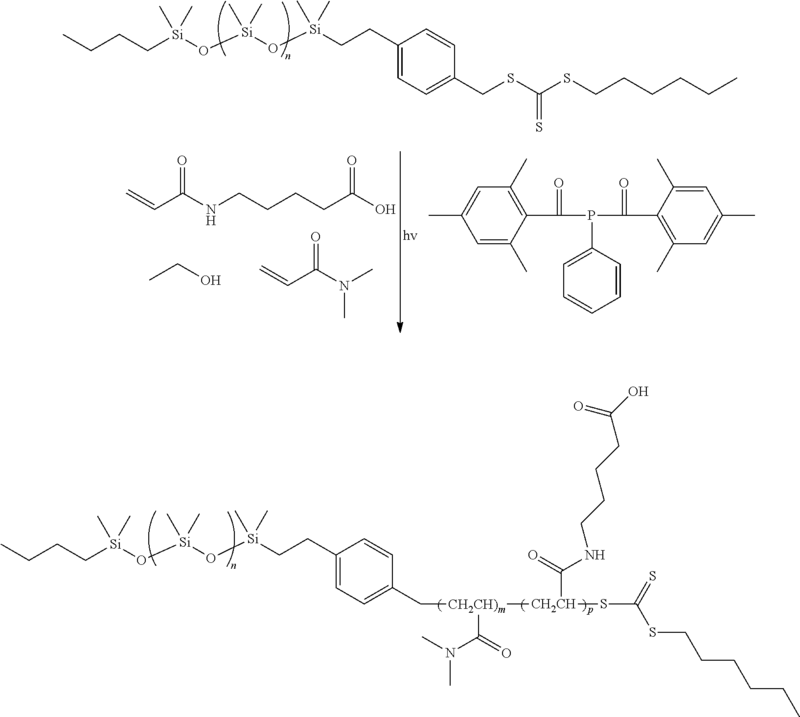 The formulations of Comparative Examples 7-8 contain monomers having methacrylate functionality (mPDMS, HOmPDMS, HEMA) and methacrylamide functionality (DMA). Thus, Comparative Example 8, displays very high PQ-1 uptake (100%). Comparative Example lenses were formed by mixing the components, in the amounts listed in Table 6 with D3O (23% D3O:77% components). Comparative Example 8 used the same formulation, but with 1.5 mol % MAA added to the formulation. The formulations were dosed in to molds (Zeonor FC/polypropylene BC) and cured for 5 minutes, at about 55° C., about 2.25 mW/cm2 intensity, and about 0.2% O2. The lenses were released and extracted in 70/30 IPA/DI and finally hydrated in standard packing solution. The lenses were sterilized at 121° C. for 20 minutes. The lysozyme and PQ1 uptake were measured and are shown in Table 5, above. A base reactive mixture having the components listed in Table 7, below was made by mixing the components in the amounts listed with t-amyl alcohol (55 wt % components:45 wt % t-amyl alcohol). Formulations were made adding ACA1 as the ionic component in the amounts listed in Table 8, below. Comparative Example 9 was formed from the formulation in Table 7, with no ACA1 added. The formulations were stirred on a jar roller for 2 hours, and then filtered. Each reactive mixture was degassed, dosed into molds (Zeonor TuffTec FC/polypropylene BC) and cured for 5 minutes, at about 60° C., about 1.5 mW/cm2 intensity, and about 0.2% O2. The molds were separated by hand. The lenses were released and extracted in 70/30 IPA/DI and finally hydrated in standard packing solution. The lenses were sterilized at 121° C. for 20 minutes. The sterilized lenses were tested for water content, lysozyme and PQ1 uptake. The results are shown in Table 8, below. This series shows that a wide range (0.25 to 3 mol %) anionic component can be used to achieve the desired increase in lysozyme uptake without increasing PQ1 uptake or undesirably increasing water content. Example 20 shows undesirable PQ1 uptake. It is believed that even though the charges are evenly distributed throughout the lens copolymer, the concentration is high enough to attract significant quantities of PQ1. These lenses would be undesirable for reusable lenses, but could be suitable for daily disposable lenses which are not cleaned and are generally not contacted with multipurpose solutions. A base reactive mixture having the components listed in Table 6, above was made by mixing the components in the amounts listed with D3O (77 wt % components:23 wt % D3O). Formulations were made adding MAA as the ionic component in the amounts listed in Table 9, below. The formulations were stirred on a jar roller for 2 hours, and then filtered. Each reactive mixture was degassed, dosed into molds (Zeonor TuffTec FC/polypropylene BC) and cured for 5 minutes, at about 60° C., about 1.5 mW/cm2 intensity, and about 0.4% O2. The molds were separated by hand. The lenses were released and extracted in 70/30 IPA/DI and finally hydrated in standard packing solution. The lenses were sterilized at 121° C. for 20 minutes. The sterilized lenses were tested for water content, lysozyme and PQ1 uptake. The results are shown in Table 9, below. The formulation in Table 9 contains both methacrylate components (HO-mPDMS, HEMA and mPDMS) as well as acrylamide components (DMA). Comparative Examples 10-13 show that such systems cannot provide the desired balance of lysozyme uptake greater than 50 μg/lens and PQ 1 uptake of less than about 10%. A base reactive mixture having the components listed in Table 10, below was made by mixing the components in the amounts listed with t-amyl alcohol (65 wt % components:35 wt % t-amyl alcohol). Formulations were made adding AMPS as the ionic component in the amounts listed in Table 11, below. The formulations were stirred on a jar roller for 2 hours, and then filtered. Each reactive mixture was degassed, dosed into molds (Zeonor TuffTec FC/polypropylene BC) and cured for 5 minutes, at about 60° C., about 1.9 mW/cm2 intensity, and about 0.2% O2. The molds were separated by hand. The lenses were released and extracted in 70/30 IPA/DI and finally hydrated in standard packing solution. The lenses were sterilized at 121° C. for 20 minutes. The sterilized lenses were tested for water content, lysozyme and PQ1 uptake. The results are shown in Table 11, below. This series shows that a wide range (0.25 to 3 mol %) anionic component can be used to achieve the desired increase in lysozyme uptake without increasing PQ1 uptake. Example 24 shows undesirable PQ1 uptake. It is believed that even though the charges are evenly distributed throughout the lens copolymer, the concentration is high enough to attract significant quantities of PQ1. These lenses would be undesirable for reusable lenses, but could be suitable for daily disposable lenses which are not cleaned and are generally not contacted with multipurpose solutions. The lenses of Example 24 were also fragile and displayed an undesirably high water content. Thus, this Example series shows that concentrations of AMPS between about 0.2 and about 1.5 mol % provide a desirable combination of lysozyme and PQ1 uptake, and water content. 4.82 g vinyl chloroformate (Aldrich) was added to 8.19 g β-alanine (Aldrich) dissolved in 74 ml acetonitrile. The mixture was refluxed under nitrogen and with stirring for 2 hours. It was cooled to room temperature for 2 hours, then filtered. The solvent was removed under reduced pressure. This crude product was dissolved in 30 ml water and washed three times with ethyl acetate. The combined ethyl acetate fractions were washed with 50 ml water. The solvent was stripped off to yield 4.51 g VINAL as an off-white solid. 3.0 g dodecylamine (Aldrich), 4.0 g Na2CO3 and 30 ml CH2Cl2 were placed into a 100 ml round bottomed flask with a stir bar and thermocouple thermometer, and under nitrogen. The flask was placed into a room temperature water bath. 1.9 g vinylchloroformate (Aldrich) was added via a side armed addition funnel. There was a modest exotherm. The mixture was stirred for about 4 hours at room temperature, filtered and washed once with 1.0N HCl and twice with water. It was dried over Na2SO4 and the solvent was stripped off to yield the crude product as a mushy solid. The crude product was dissolved in a minimal amount of methanol, and precipitated with water. The solvent was removed and the crystals were dried under vacuum to yield 2.2 g product. 19.6 g N-vinylpyrrolidone (ACROS, 98%), 0.40 g VINAL and 10 μl 2-hydroxy-2-methylpropiophenone (Aldrich) were combined to form a clear blend. The solution was placed into two 14 mm diameter polypropylene tubes. These tubes were irradiated with UV light from 4 Philips TL 20W/09N fluorescent bulbs for 4 hours in a nitrogen environment. The solid polymer was removed from the tubes and stirred in 150 ml tetrahydrofuran to dissolve. This solution was poured into 700 ml diethyl ether with stirring to precipitate the polymer. The solid was recovered by filtration, redissolved in THF, and reprecipitated with diethyl ether. It was recovered by filtration and dried for 48 hours under vacuum to yield polymer as a soft white solid. The procedure of Preparation 9 was used to form copolymer from 4.8 g N-vinylpyrrolidone, 0.1 g VINAL, 0.1 g DVC and 6 μl 2-hydroxy-2-methylpropiophenone. The procedure of Preparation 9 was used to form PVP homopolymer from 10 g N-vinylpyrrolidone and 6 μl 2-hydroxy-2-methylpropiophenone. Solutions having a concentration of 1 wt % were formed by adding 1 g of each of the polymers made in Preparations 9-11 in 100 g borate buffered saline solution (pH 7.4) and mixing for 2 hours at 60° C. 3 ml of each solution was placed into each of several vials. One senofilcon A contact lens (ACUVUE OASYS™ BRAND CONTACT LENSES with HYDRACLEAR™ Plus) was placed into each vial. The vials were sealed and autoclaved at 121° C. for 30 minutes. The lenses were rinsed in fresh borate buffered saline and tested for contact angle using the sessile drop method. The results are shown in Table 11. Contact angle 37 ± 6° C. 38 ± 10° C. 60 ± 10° C.
Desirable decreases in contact angle were achieved however, the lysozyme uptake was not significantly increased. Comparing Comparative Examples 14 and Example 19, which contained 2-4 mol % anionic monomer to Examples 2-4, it is believed that increasing the concentration of the anionic monomers in polymers used in Comparative Examples 14 and 15 to at least about 20 mol % and in some embodiments at least about 30 mol % or greater, will provide the desired lysozyme uptake. wherein said major polymerizable components comprise a single reactive functionality selected from the group consisting of acrylate, methacrylate, acrylamide, and methacrylamide; and wherein any polymerizable components in the reaction mixture which have a reactive functionality different than said single reactive functionality are present in a concentration less than 0.5 mol %. 2. The silicone hydrogel of claim 1 wherein said single reactive functionality is methacrylamide and said reactive ionic monomer comprises at least one acrylamido sulphonic acid or acrylamido sulphonic acid salt. 3. The silicone hydrogel of claim 2 wherein said acrylamido sulphonic acid comprises an alkylene group comprising 2 to 4 carbon atoms. 4. The silicone hydrogel of claim 2 wherein said reactive ionic monomer comprises 2-acrylamido-2-methylpropane sulfonic acid salt. 5. The silicone hydrogel of claim 1 further comprising at least one non-reactive wetting agent. 6. The silicone hydrogel of claim 1 further comprising a water content of between about 20% and about 70%. 7. The silicone hydrogel of claim 1 further comprising a water content of between about 25% and about 65%. 8. 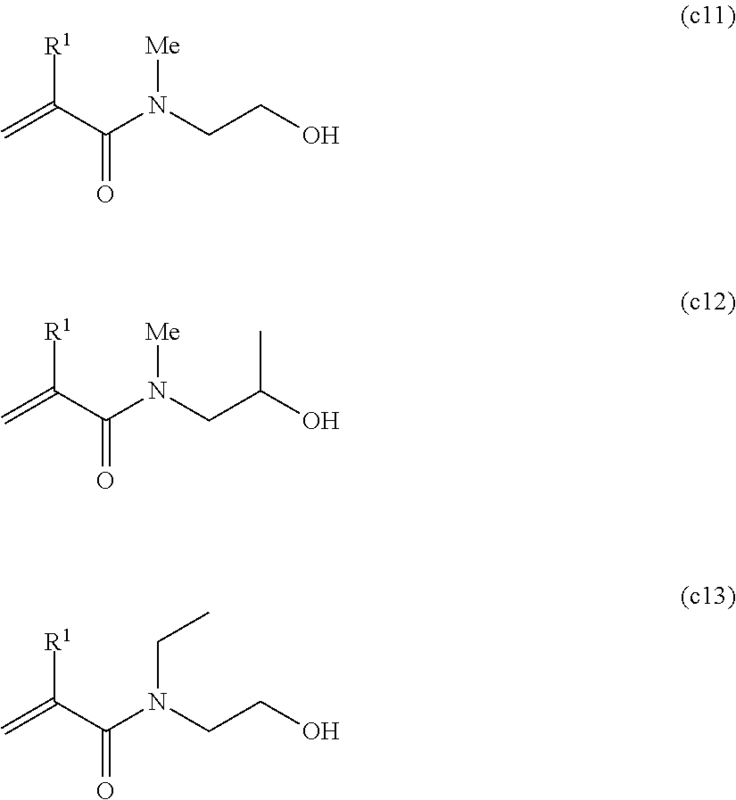 The silicone hydrogel of claim 1 wherein said reactive ionic monomer is selected from the group consisting of 3-acrylamidopropionic acid, 4-acrylamidobutanoic acid, 5-acrylamidopentanoic acid, sodium-2-(acrylamido)-2-methylpropane sulphonate, 2-acrylamido-2-methylpropane sulfonic acid and combinations thereof. Babmann-Schnitzler et al, Sorption properties of hydrophobically modified poly(acrylic acids) as natural organic matter model substances to pyrene, Colloids and Surfaces A: Physiocochem. Eng. Aspects 260 (2005) 119-128. Bannister, et al, "Development of Branching in Living Radical Copolymerization of Vinyl and Divinyl Monomers", Macromolecules 2006, vol. 39, pp. 7483-7492. Burchard, "Particle Scattering Factors of Some Branched Polymers", Macromolecules 1977, vol. 10, No. 5, pp. 919-927. Burchard, "Solution Properties of Branched Macromolecules", Advances in Polymer Science, 1999, vol. 143, pp. 113-194. Burchard, et al, "Information on Polydispersity and Branching from Combined Quasi-Elastic and Integrated Scattering", Macromolecules 1980, vol. 13, pp. 1265-1272. Encyclopedia of Polymer Science and Engineering, N-Vinyl Amide Polymers, Second edition, vol. 17, pp. 198-257, John Wiley & Sons Inc. and reported in K-values, 1989. 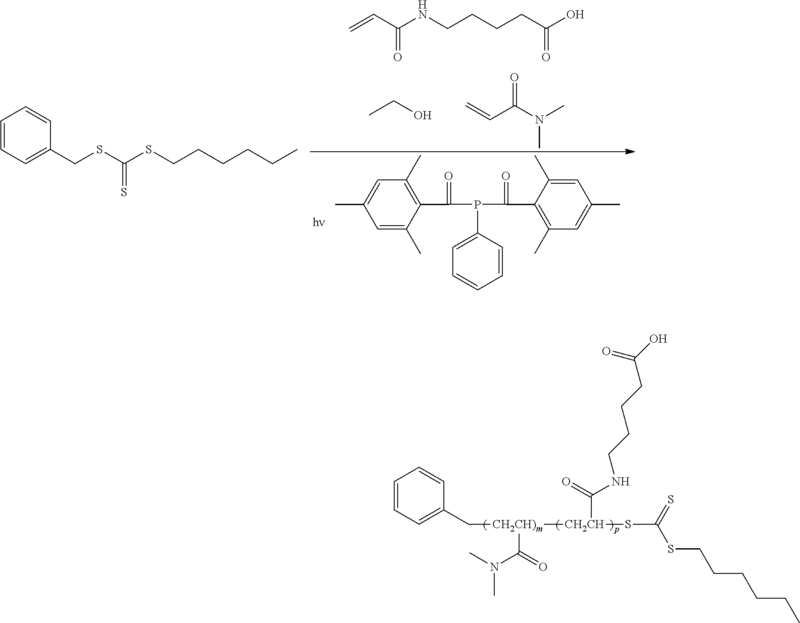 Gao, et al, "Synthesis of functional polymers with controlled architecture by CRP of monomers in the presence of cross-linkers: From stars to gels", Progress in Polymer Science 2009, vol. 34, pp. 317-350. Huan et al: "Synthesis and Properties of Polydimethylsiloxane-Containing Block Copolymers via Living Radical Polymerization", Journal of Polymer Science: Part A: Polymer Chemistry, vol. 39, 2001, pp. 1833-1842. ISO 18369-4:2006: Ophthalmic optics-Contact lenses-Part 4: Physicochemical properties of contact lens materials, 2006. Karunakaran et al, Synthesis, Characterization, and Crosslinking of Methacrylate-Telechelic PDMAAm-b-PDMS-b-PDMAArn Copolymers, Journal of Polymer Science: Part A: Polymer Chemistry, vol. 45, 4284-4290 (2007), Wiley Periodicals, Inc.
Lowe et al: "Reversible addition-fragmentation chain transfer (RAFT) radical polymerization and the synthesis of water-soluble (co)polymers under homogeneous conditions in organic and aqueous media", Prog, Polym. Sci. 32 (2007) 283-351. McDowall et al: "Synthesis of Seven-Arm Poly(vinyl pyrrolidone) Star Polymers with Lysozyme Core Prepared by MADIX/RAFT Polymerization", Macromolecular Rapid Communication, vol. 29, 2008, pp. 1666-1671. Mosmann, Rapid Calorimetric Assay for Cellular Growth and Survival: Application to Proliferation and Cytotoxicity Assays, Journal of Immunological Methods, 65 (1983) 55-63. Pavlovic et al: "Synthesis and characterization of hydrophilic silicone copolymers and macromonomers for opthalmic application", Database accession No. 2008:955522; & Abstracts of Papers, 236th ACS National Meeting, philadelphia, PA, US, Aug. 17-21, 2008, POLY-113 Publisher: American Chemical Society, Washington, DC 2008. PCT Intenational Preliminary Report on Patentability, dated Nov. 25, 2014 for PCT Int'l Appln. No. PCT/US2013/042644. PCT International Preliminary Report on Patentability, dated Nov. 15, 2012, for PCT Int'l Appln. No. PCT/US2011/035324. PCT International Preliminary Report on Patentability, dated Nov. 25, 2014, for PCT Int'l Appln. No. PCT/US2013/042628. PCT International Preliminary Report on Patentability, dated Nov. 25, 2014, for PCT Int'l Appln. No. PCT/US2013/042658. PCT International Preliminary Report on Patentability, dated Nov. 5, 2013, for PCT Int'l Appln. No. PCT/US2012/035722. PCT International Search Report, dated Aug. 11, 2011, for PCT Int'l Appln. No. PCT/US2011/035324. PCT International Search Report, dated Feb. 26, 2014, for PCT Int'l Appln. No. PCT/US2013/042628. PCT International Search Report, dated Jul. 11, 2012, for PCT Int'l Appln. No. PCT/US2012/035722. PCT International Search Report, dated Mar. 6, 2014, for PCT Int'l Appln. No. PCT/US2013/040066. PCT International Search Report, dated May 27, 2014, for PCT Int'l Appln. No. PCT/US2013/042658. PCT International Search Report, dated Oct. 29, 2013, for PCT Int'l Appln. No. PCT/US2013/042644. Shedge et al, HydophobicallyModfedPoly(acylicacid) Using 3-Pentdeyccycloheylanine: Synthesis and Rheology, Macromolecular Chemistry and Physics 2005, 206, 464-472. Sugiyama, et al, "Evaluation of biocompatibility of the surface of polyethylene films modified with various water soluble polymers using Ar plasma-post polymerization technique", Macromolecular Materials and Engineering, (2000), 282, 5-12. Vo, et al., "RAFT Synthesis of Branched Aacrylic Copolymers", Macromolecules 2007, vol. 40, pp. 7119-7125. Vogt, et al, "Tuning the Temperature Response of Branched Poly(N-isopropylacrylamide) Prepared by RAFT Polymerization", Macromolecules 2008, vol. 41, pp. 7368-7373. Volume III, Photoinitiators for Free Radical Cationic & Anionic Photopolymerization, 2nd Edition by J.V. Crivello & K. Dietliker; edited by G. Bradley; John Wiley and Sons; New York; 1998. Wooley, et al, A 'Branched-Monomer Approach' for the Rapid Synthesis of Dendimers**, Angew. Chem. Int. Ed. Engl. 1994, vol. 33, No. 1, pp. 82-85.